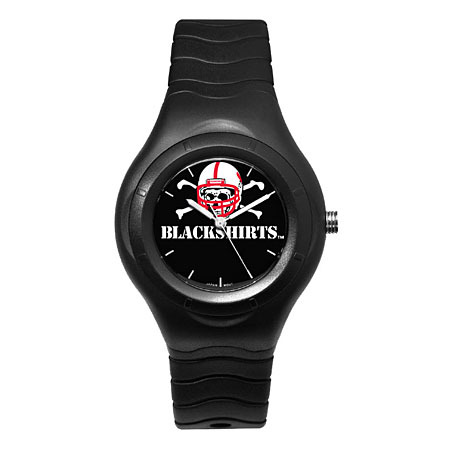 University of Nebraska shadow football watch is sporty, durable, and at great price. The Shadow Watch is a hit with sports fans of all ages. Watch case is 1 5/8 inches wide. The watch dial diameter is one inch. The watch case is made of black ABS plastic resin with a stainless steel screw back. Black polyurethane rubber strap with stainless steel buckle. Acrylic crystal face. Miyota quartz movement (377 battery). Hanging flat blister packaging. Limited lifetime warranty. Team logo is shown boldly in the center of the watch. Water resistant.